Before I get to this delicious recipe created by Food Network Chef Ben Vaughn, I have to tell you about an exciting giveaway. You can win two tickets to meet Chef Ben and enjoy one of his fabulous tasting dinners July 18, 2013. The tickets are valued at $50 each. To enter, simply Pin It to Win It! This summer, Beth’s Table is hosting a series of dinners with Chef Ben and other chefs from around the country. 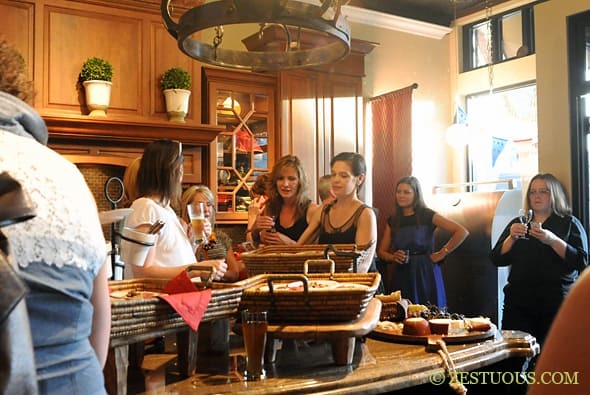 The next event is at 7 p.m. July 18, 2013, in Naperville, Illinois. I traveled from Las Vegas to attend the first event in June. It was fabulous. You can read about my experience here. If you’re within driving distance of Chicago, I highly recommend you attend. It’s a very up-close and personal foodie event. Not only will you sample Chef Ben’s fantastic menu, you’ll also have the opportunity to interact with him in a small setting. He’s happy to answer your culinary questions. You have probably seen Chef Ben Vaughn on Food Network’s TV Show Health Inspectors. Raised in Florida, he received his culinary training at the Fort Lauderdale Art Institute and in his grandma’s kitchen. Face it. There is nothing like what grandma can teach you. He has owned numerous restaurants in Memphis and Atlanta, and he enjoys teaching others about food and the restaurant business. And his food is worth learning about. He brings a whole new class to Southern comfort food. I love the flavors of the South. I’ll eat pimento cheese sandwiched between fried green tomatoes any day of the week. 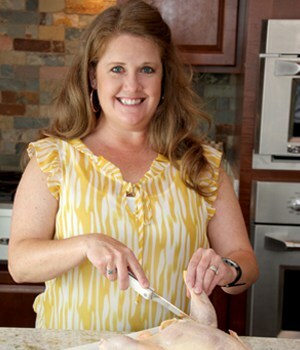 Chef Ben is able to transform the simple heart and soul of the South into high-end cuisine. It looks beautiful and complex, but it still tastes like the familiar comfort food I love. He’s also a trip. He has a fun sense of humor that has me cracking up every time I talk to him. His playfulness spills onto the plate. He’s not afraid to make his own pop rocks or add duck fat to chocolate cake. 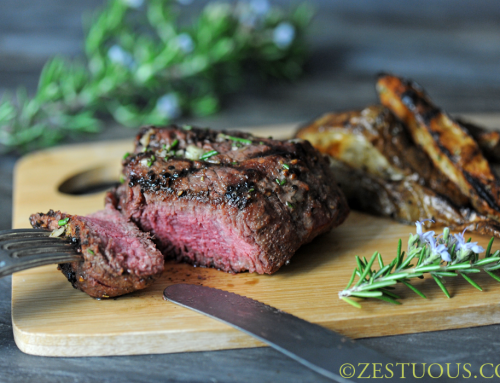 Chef Ben has teamed up with Zestuous. He has offered to share some of his recipes, so I can pass them onto you. This is quite a treat. I’m excited to work with him and to create his tastes of the South, and I’m thankful that he is allowing me to share them with you, so you, too, can taste these fantastic flavors. 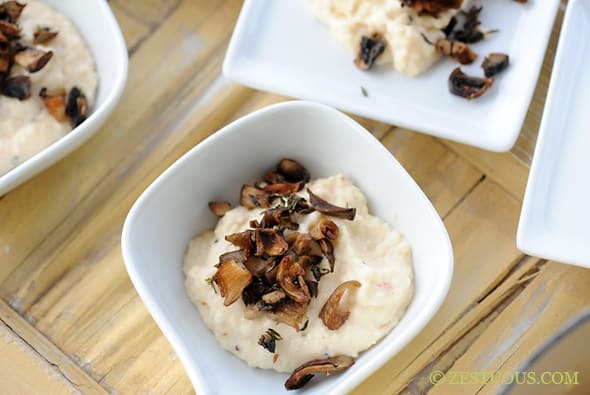 The first recipe is Low Country Grits with Seasonal Roasted Mushrooms. I love grits. I’ll eat them with sugar or cheese, and I love them with shrimp. First chef tip in this recipe is to use whole cracked grits. 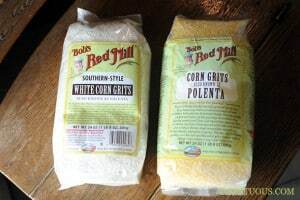 I found Red Mill’s Southern Style White Corn Grits at Whole Foods. 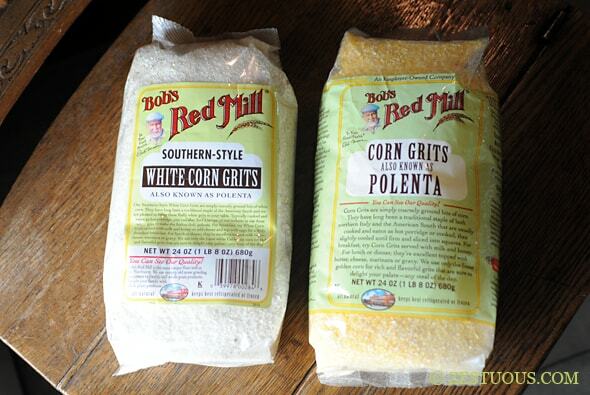 Use this type of grits instead of the yellow polenta-style grits. And please don’t use instant. 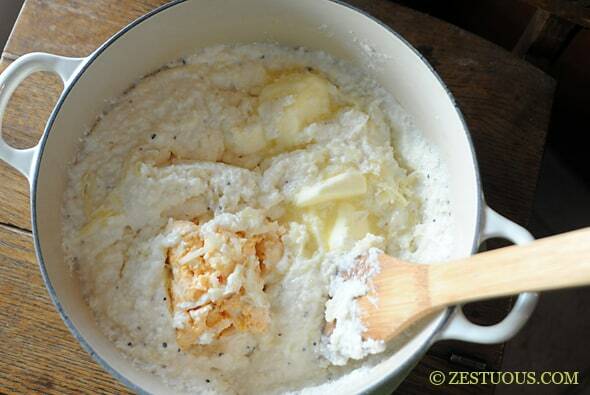 You want grits with a little texture. 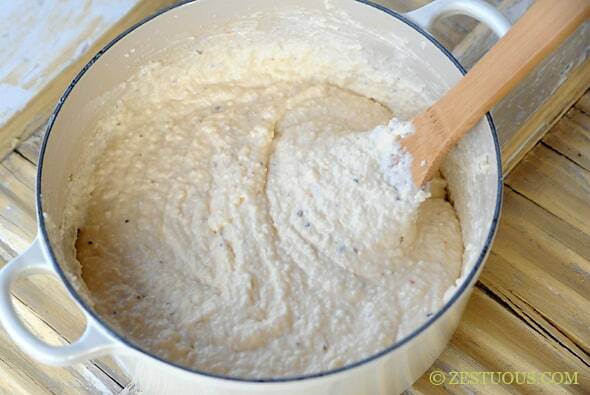 After preparing your grits, you’ll mix in a variety of cheeses, including pimento cheese. I make my own Pimento Cheese. There’s almost always a batch in my fridge. Next, chef mixes in two egg whites. I was puzzled by this addition, so I asked chef why egg whites? He said it creates body, texture and stability and keeps all the fat from the cheese and butter from separating. Genius! The grits have to be slightly cool when mixing in the eggs, so they don’t scramble. The heat should cook the eggs slightly, but if you’re worried about raw eggs, you can buy the refrigerated pasteurized egg whites. 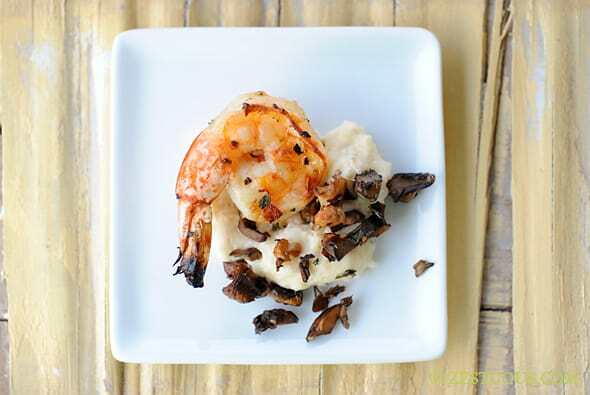 Seasonal Roasted Mushrooms top these creamy, cheesy grits. I used baby bellas, Italian brown mushrooms and oyster mushrooms. 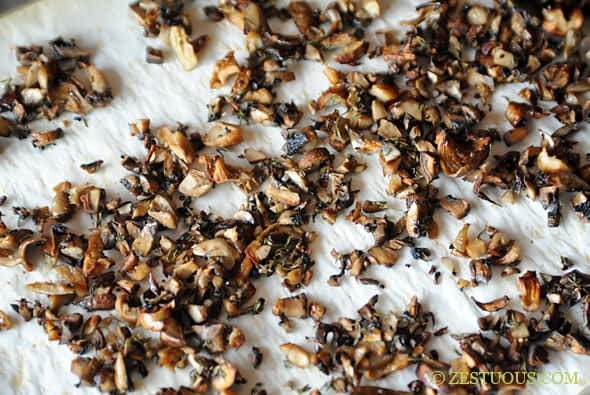 You can mix your mushrooms or just buy your favorite seasonal variety. The flavor is great. 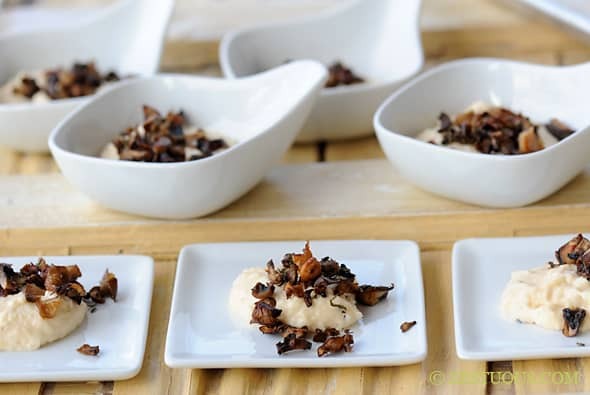 They have just enough acid from the vinegar and a real earthy loveliness from the thyme and the natural umami flavor that seasonal mushrooms offer. This dish is great on it’s own, but if you want to add a little protein, I’ve developed a recipe for Tabasco Grilled Shrimp to accompany the recipe. 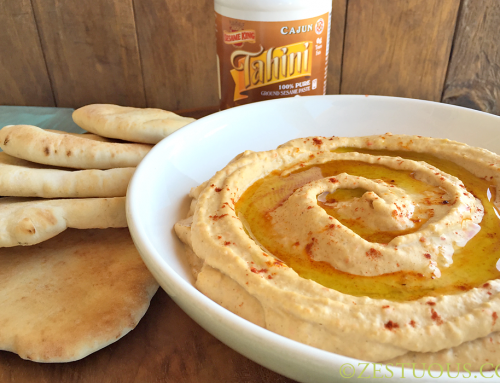 It has complementing flavors found in Chef Ben’s recipe, and is ready in minutes. 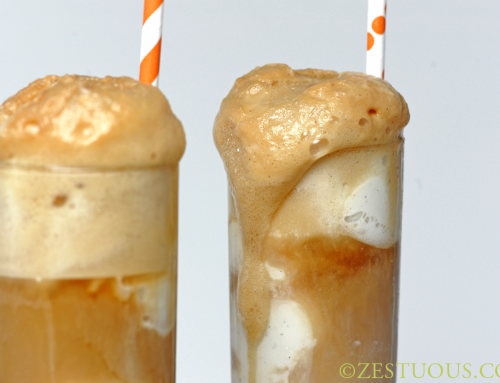 Best of luck on the contest, and I hope you enjoy the recipe. Stay tuned for more creations from Chef Ben. 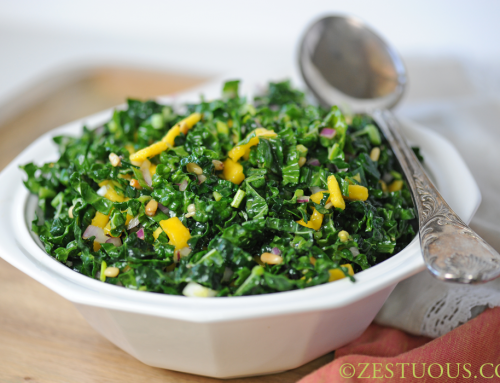 Place all the ingredients in a large pot and cook over low heat for 20-30 minutes, stirring often. The grits are done when they have are the consistency of oatmeal. Fold the butter, cream cheese, pimento cheese, Swiss cheese and Tabasco sauce into the grits, until melted. Still off the heat, after you have cooled the mixture by folding in the cheeses, butter and Tabasco add the 2 egg whites. 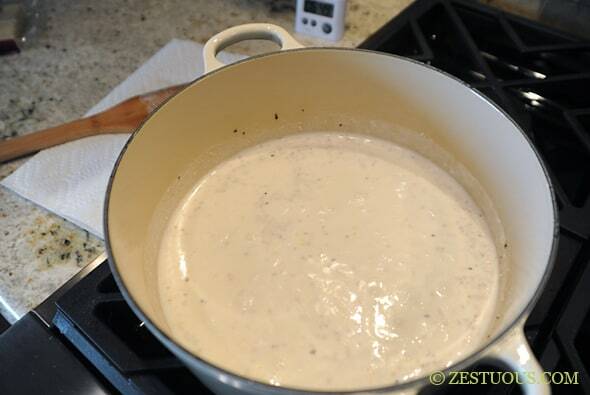 Make sure the grits and cheese mixture is cooled sufficiently before adding the egg whites. If the mixture is too warm, it will scramble the eggs. Heat the oven to 475° F. In a medium bowl, toss the mushrooms with olive oil, thyme, vinegar and white wine to coat generously. Then, add salt and pepper to taste. 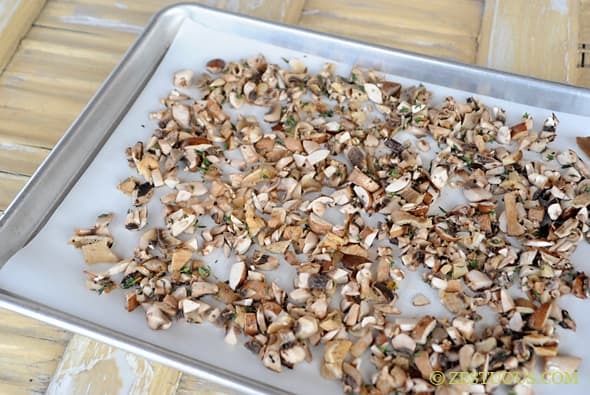 Turn the mushrooms out onto a parchment-lined baking sheet. Roast the mushrooms until brown on the bottom, 15-20 minutes. Flip and continue to roast until browned on the top, 5 to 10 minutes. Spoon over the Low Country Three Cheese Grits and enjoy! 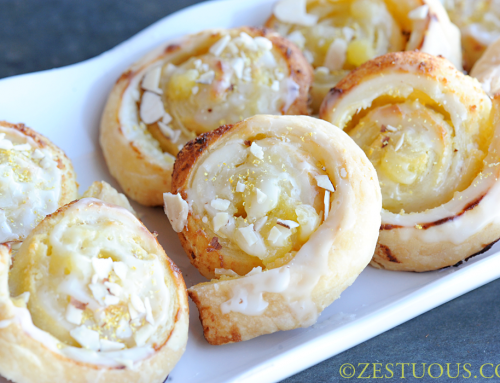 You must leave a comment below letting me know you shared the recipe. The comments will be numbered in order, and the winner will be selected by a random number generator. I will reply to your comment to let you know that you won. You’ll need to contact me within 24 hours. If I don’t hear from you in 24 hours, I will pick another winner. This giveaway includes 2 free tickets (valued at $50 each) to Chef Unplugged hosted by Beth’s Table July 18 in Naperville, Illinois. It does not include transportation. Pinterest in no way associated with this contest. Looks fabulous! I just pinned it. I would love to be at the tasting! Thanks Kim. Best of luck. Congratulations!!! You are the winner of the 2 free tickets to Chef Unplugged. I sent you an email. Please respond and we’ll coordinate the details. I love that your mom introduced you to different foods early on. If Chef Ben makes it out west, I’ll let you know. This blog was quite impressive. I am now following it on twitter!! Thanks darlin’. 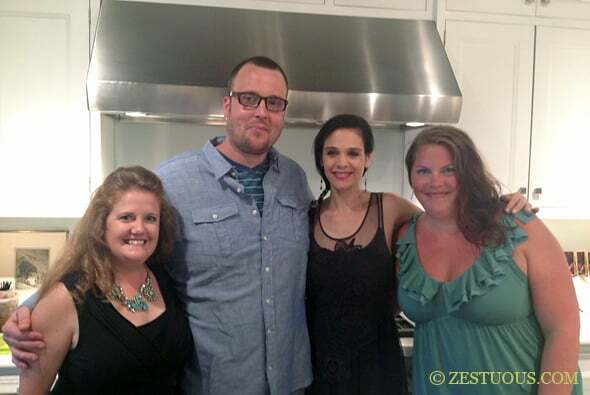 Can you imagine a Chef Unplugged with you, me, Beth, Heather and both Bens. Too fun! Me too. I hope it’s before November.